Based at the Arcola Theatre in London, Arcola Energy is a multi-disciplinary developer, manufacturer and retailer of fuel cell-based low carbon energy solutions. We operate across a wide range of markets with applications in home, industry, construction, entertainment, education and aerospace sectors. Arcola Energy leads engineering projects for Horizon Fuel Cell Technologies within the UK and Europe as well as being their UK agent and distributor. Development of Arcola’s mass customisation manufacturing approach is supported by the UK Technology Strategy Board. 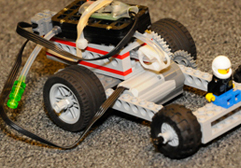 Based on Arcola’s creative science education workshops World Stage Design 2013 brought an engineering and design challenge – to test how far can your Lego car go on a limited amount of hydrogen? Using customised designed Lego kits and hydrogen fuel cells, this session looked at efficient design and low-carbon alternatives.